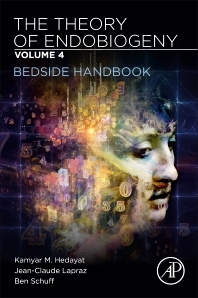 The Theory of Endobiogeny Volume 4: Bedside Handbook provides a concise handbook on the latest information relating to the theory of endobiogeny for current clinical practice. It includes applications of biological modeling, assessments of disorders, endobiogenic analysis, and tips for using biological modeling tools for treatment. This approach is an evolution in thinking from reductionism to holism, offering advice for symptomatic treatments that can be used in conjunction with a new way of thinking about diseases and disease management. Dr. Hedayat is a Stanford-trained critical care physician and an internationally published scholar on medical ethics. As an international lecturer and recognized authority on medical aromatherapy, Dr. Hedayat has published extensively on the use of plants, nutritional supplements and essential oils for various diseases. Dr. Hedayat is the founder and director of Full Spectrum Health Center. Dr. Lapraz is a French Medical Doctor, world-renowned pioneer in the field of clinical phytotherapy and aromatherapy, and the co-innovator of Endobiogeny. This innovative medical concept, based on a refined view of the neuro-endocrine system, integrates classical medicine with herbs and supplements, essential oils, dietary and lifestyle modifications to create a truly holistic treatment approach to illnesses of the body and mind. Dr. Lapraz is currently dedicating his time to writing and training physicians so that more people can have access to Endobiogenic care in the future, in the USA and other countries throughout the world. Ben Schuff is a naturopathic medical doctor (2019), Endobiogenic researcher and board member of Whole Systems Healthcare, a non-profit developing holistic, multi-scale healthcare models where he explores the role of Endobiogeny within this model.